Josephine with Ethan Gilbert, CEO of Greentek Recycling. International House had the honor of hosting two cohorts of Professional Fellows from Zambia and Zimbabwe this past year. Our most recent delegation featured 6 dynamic young entrepreneurs who spent three weeks with us in October. They enjoyed staying with their Charlotte home hosts and made the most of their time in the Queen City by networking and connecting to other entrepreneurs, business executives and academic scholars. One example is Ms. Josephine Takundwa who runs ‘Earthlink Technologies’ in Zimbabwe. She distributes power surge protectors and IT Hardware throughout Southern Africa. 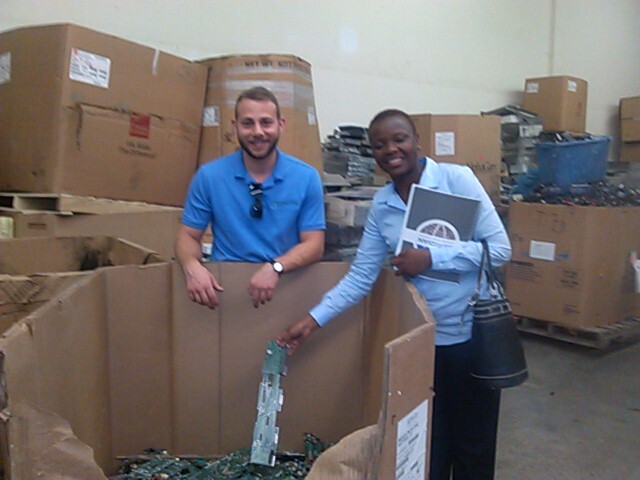 During a meeting and site tour with Ethan Gilbert, CEO of Greentek Recycling, Ms. Takundwa learned about the business of IT hardware recycling. This is a service that is currently not provided in Africa, and she was able to broker a deal involving shipping containers of used IT hardware from Zimbabwe to be recycled by Greentek right here in Charlotte. Josephine also met with top executives at Duke Energy facilitated by our Board member Mr. Jose Merino and also toured the IT network system lab at CPCC, thanks to a meeting set up by Dr. Maha Gingrich, another IH Board member. Another member of the delegation, Ms. Misozi Mkandawire, who is starting a micro financing venture in Zambia, also found an interested investor at an entrepreneur meetup in the South Park area. International House partners with the U.S. State Department and other national agencies to bring scores of emerging global leaders to Charlotte every year. These international guests are leaders in the government, business or NGO sectors in their home countries and are seeking to connect with their professional peers in the United States. This is “soft diplomacy” at its best. “People to people” connections break down barriers, build understanding, and promote prosperity and peace. Our Citizen Diplomacy program is an important part of how International House welcomes the world to Charlotte! This entry was posted in Uncategorized and tagged Africa, Charlotte, Citizen Diplomacy Program, international house, International Visitor Leadership Program, Professional Fellows, zambia, Zimbabwe by ihcharlotte. Bookmark the permalink.